The Basque expedition led by the writer and researcher Miguel Gutiérrez Garitano, has made a “revolutionary discovery” in the Andes Mountains in Peru. Although it is not known how long ago it was built, it is possible that the “Inca altar” dates back to the time when Tupac Inca Yupanqui (Tenth Inca sovereign) ruled. 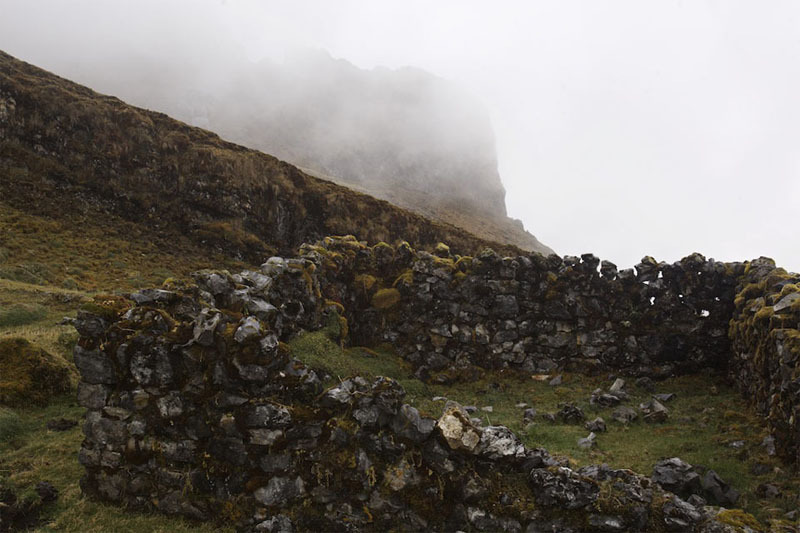 Miguel and Rafael Gutiérrez Garitano, after spending three weeks in Peru, discovered an Inca sanctuary of the fourteenth century that should have served to worship their gods; possibly in times of natural disasters or other difficult times for the empire. Near this sanctuary has been found a huge necropolis with corpses buried in caves. The Basque expedition believes that it is a ceremonial center where people were sacrificed, possibly children . If this is true, in this place children were offered to the gods. This type of offerings took place in a ritual ceremony called “Capacocha” in the mountains of the Andes. Where is the sanctuary of sacrifices? It must have been a hidden ceremonial center where human sacrifices were made to obtain the favor or mercy of their gods; at least that suggests the platform built on top of a mountain that rises to 5,000 m.s.n.m. in the district of Vilcabamba, in the province of La Convención, 150 km from the city of Cusco. Miguel Gutierrez Garitano points out that the satellite images taken from the Vilcabamaba mountain range were initially a project about the lost kingdom of Vilcabamba; As the investigation progressed, local peasants told him about the existence of Inca constructions, and they attracted his attention. Satellite images revealed a sanctuary; Rut Jiménez, the team’s geologist, detected a series of rectangular enclosures with features that matched Inca constructions. A monumental building of 22 m. along with other structures, form a square (kancha). The rest of the mountain shows structures of the same type. No less than 50 structures were found related to the worship of human sacrifices . Some of them had to serve as resting places for the people who were to officiate the ceremony. There are many places where children seem to have been sacrificed; and there is a platform where they could be buried; although to know it, they will have to dig. The sanctuary has not been the only important discovery; there was also a gigantic cemetery with dozens of tombs inside caves . In one of the tombs, Miguel Gutierrez found a skeleton; notwithstanding a detailed study of the land, I reveal that this hill is full of tombs, are dozens with the same characteristics. In one of the tombs can be seen corpses of men dressed in sumptuous fashion, but also the corpse of a girl with less elaborate clothes, apparently was buried with them to take care of them. The expedition through the Andes has had to face the altitude, the rain, the cold and the risks of the rugged geography of the place. But not all, the presence of drug traffickers in the area, has made the expedition even more dangerous . The Basque team has proposed a project to recover this important archaeological site. To carry out tasks of conservation and cleanliness, to preserve the important archaeological site, to promote tourism in the area and to benefit the surrounding communities. Carmen Martin Rubio historian and specialist in the Andean world, after examining the images sent by the exploration team in the mountains of Vilcabamba, determined that the structures found are similar to those of other areas, specifically in the volcano of Ampato in Arequipa (Peru), where the “juanita mummy” was found and in Llullaillaco, in Salta (Argentina); both, places Capacocha . When the Inca Empire suffered droughts, famines or natural catastrophes, its inhabitants made offerings to their gods. For this, ceremonial centers were built where people were sacrificed. The mummies found in these places belong to children and adolescents chosen among the most beautiful, these belonged to the best families and the elite of the empire. This ritual was called “Capacocha”. Why children? Because children were considered pure. It is known that death came to them in a sweet way; they felt nothing because they were drugged with coca and chicha until they fell asleep; thus, they were exposed to the low temperatures of the mountain tops until they died frozen. These children used to be between 7 and 8 years old although they have been found mummies of older age. In the Salta mountain in Argentina were 3 children between 8 and 12 years old and a 15 year old girl. If you want to have your own adventure, do not hesitate, Machu Picchu is waiting for you. For more information about the Machu Picchu Ticket and organize your trip to the Inca wonder, please contact us at: info@boletomachupicchu.com.